Ladies marks and spencer size 12 new with tag jacket, spfh. Condition is New with tags. 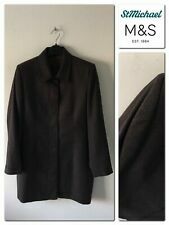 Limited Edition M & S Brown Wool Coat Size 14. Condition is Used. Dispatched with eBay delivery – Barely worn dark soft woollen coat. Fairly lightweight so perfect for this time of year. Size 14. Fully lined. M&S St Michael Pure New Wool Brown Jacket Size 10 Bust 33"
100% Pure New Wool. Size 10 Bust 33". 100% Polyester Lining. Marks And Spencer Pink Ladies Jacket Size 12 BNWT. Condition is New with tags. Dispatched with eBay delivery – Shutl 1 day. Single breasted with 4 matching buttons. It is 100% wool and cost round £250.00. I have never worn it and now it does not fit! Worn twice- excellent condition Double breasted - wool/cashmere.Detachable fur collar. Please check ALL photos as no returns will be accepted. Lovely wool jacked with velvet collar. 12-14 In lovely condition. LADIES MARKS AND SPENCER PER UNA. 44% ACRYLIC 32% POLYESTER 18% WOOL. NAVY BROWN AND RUST CHECK JACKET. NAVY LINING 100% POLYESTER. 2% VISCOSE AND 1% COTTON. WITH TWO FRONT POCKETS. Wool rich fabric. Tailored fit, hip length. Properly structured & fully lined. An excellent ladies' blazer jacket by M&S AUTOGRAPH. 50% polyester, 48% new wool, 2% elastane. Lined in a semi satin fabric. Gorgeous Ladies Jacket Marks And Spencer Size 12 in burnt orange colour. The hood is removable and the waist is adjustable via toggles inside the jacket. Perfect for slightly milder weather and looks great with jeans! In immaculate condition, its a size 14 from Marks and Spencer, its 100% wool and has no collar, its fully lined and has one button at the top that shows and the rest are concealed, its very smart. LENGTH: 32". Pre-worn - Very Good / Clean Condition. Quality Woman's Blazer Jacket. Main Fabric : 100% Pure New Wool. Colour : Check Brown – see photos. Top to Bottom : Top of collar to lower hem : 25.5”. Top to Bottom : Bottom of collar to lower hem : 24”. Marks and Spencer Size 12 Ladies Suit Jacket BNWT. Condition is New with tags. Dispatched with Royal Mail 1st Class. You are looking at a great quality Marks & Spencer dark brown pure new wool jacket, size 12. It measures 19” across from pit to pit and 27” long from shoulder to hem. It has button fastening with x2 outer pockets and fully lined. It’s in great condition and would be a great item for your wardrobe and looks really smart. I pride myself on delivering an excellent service and I also use a signed for postal service to ensure you receive your item safely Thanks for looking!!! Stitching of right pocket coming slightly loose inside (see pictures). Marks And Spencer Ladies Wool And Silk Blend Jacket Brown Mix. Made From 40% New Wool, 40% Polyester And 20% Silk. Lovely Brown Mix Design. Zipper For Fastening. Light, Comfortable And Soft To The Touch, Made From High Quality Fabrics. Mink Taupe Zip A-line Work Career Smart. TWO HIDDENBUTTONS TOP ONE SHOWING. 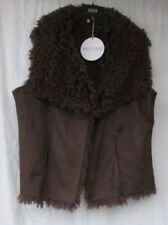 Ladies M&S chocolate brown pure new wool coat size 10. Tortoiseshell buttons. Condition is Used. 22% wool / 3% polyamide, 48% acrylic, 26% polyester,1% cotton - dry clean only - quite a light feel wool jacket. Gorgeous wool mix jacket - great for casual smart look with jeans (slight cowboy checked shirt look - but chunkier - has discreet shoulder pads for boxy look). Woollen Coat with Polyester lining. Double breasted Reefer Coat with extra top bottom to close to the neck. 2 front pockets, hip length coat. Lovely Autumn colours - deep red, browns, orange and grey fleck in a loose houndstooth check. Wool blend 12%. Dark red polyester lining. Jacket sits on hip and fitted in style. Would look great with a white shirt and jeans. Sleeve (pit to cuff) 15". Smart great for casual and work. In very good condition warm classic jacket/coat. Lining inside has been repaired. Comfortable pocket at the front. Labeled like size 16 French 44 and presented on model in size UK10. Will suitable for size 14. Marks and Spencer Ladies Jacket. Length 23" plus elastic under foot. Waist 38" (19" laid flat). Condition - Excellent.